The Tree Care Industry Association is a trade association of 2,300 tree care firms and affiliated companies worldwide, and was established in 1938 as the National Arborist Association. Their mission is to advance tree care businesses. The TCIA develops safety and education programs, standards of tree care practice, and management information for tree and landscape firms around the world. They provide continuing education, training, conferences, and publications to promote the safe and appropriate practice of tree care. 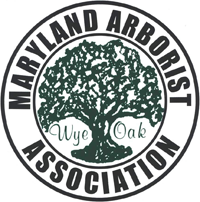 The Maryland Arborist Association is a professional trade association dedicated to fostering best practices within the region's arboriculture industry, providing education forums for ongoing training and safety, and promoting community service through volunteerism. We are fully insured. Please feel free to ask for a copy of our insurance certificate during your estimate.